Time for soccer analysts to perk up because D.C. United’s 2015 season is the one to watch if you are into numbers. Why? Because in 2014, D. C. United defied them. And the story of the year, at least for the geeks, is whether or not D.C. United can do it again. After one of the worst seasons in franchise history in 2013, D.C. United shocked the league and won the Eastern Conference in 2014. A turnaround like that required improvement on both sides of the ball. 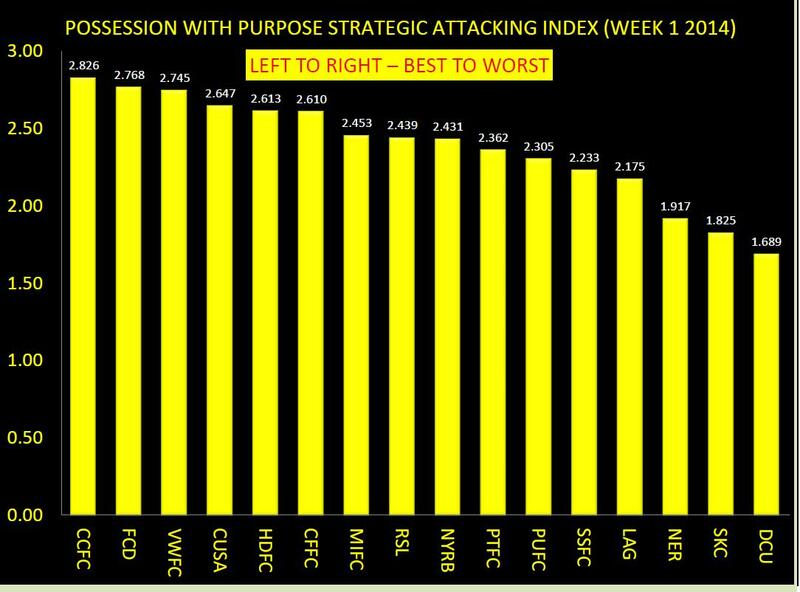 United went from easily the worst offense in the league with 22 goals to a solid offense with 52. And they turned the worst defense in the league with 59 goals allowed to tied for the league’s best with 37 goals. So what’s the problem? The issue is that the numbers say it shouldn't have happened. The ASA expected goals model says that D.C. United should have scored just 38 goals compared to their 52. And on the defensive side the ASA models thinks that 48.6 goals against would have been a more likely number, compared to the actual 37. Their expected goal ratio in fact was 3rd worst in MLS. Michael’s Caley’s expected goals model suggests a similar story to that of ASA. Were D.C. United just lucky or are they doing something that the models don’t contemplate? 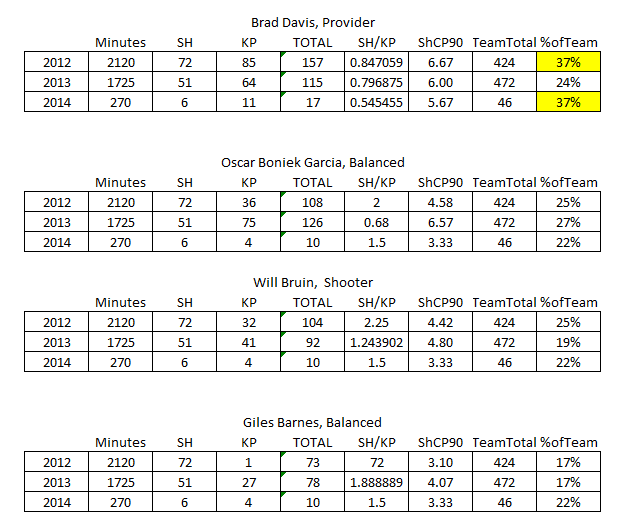 On the offensive side of the equation the positive story can be traced to two dynamics scorers. If United fans had their way, they’d pair Luis Silva and Fabian Espindola at the top of Ben Olsen’s 4-4-2 formation. And despite the fact that the two play a very similar style of forward, they’d be right. That pair was the reason for the strong shooting from United. The paid scored 22 goals last season, but the ASA expected goals model suggest they should have 11.4. 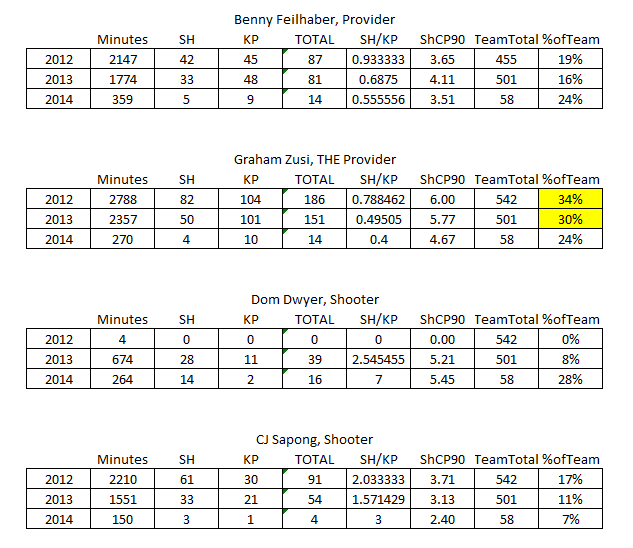 That 10+ goal gap is most of the team’s “overproduction” last year. Espindola’s finishing prowess is puzzling because he actually took his shots on average four feet further from the goal than other shooters. Remarkably he was terrific at avoiding blocked shots. While shooters on average have their shots blocked one in every four attempts, Espindola had that happen approximately once in almost eight attempts. He may have been more focused on getting open looks versus how far he was from the goal. 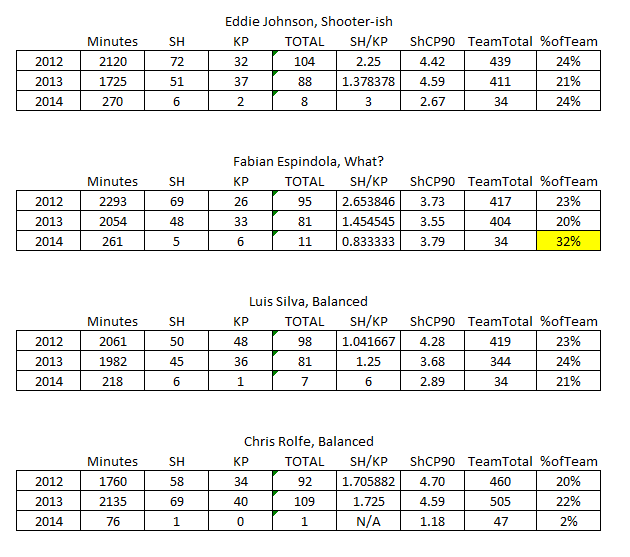 Silva’s ability is tougher to figure. Everything but his finishing rate appears average. His shots on target level was slightly higher than average and the percentage of his shots that were blocked was 23 percent. Unless the team finds new ways to increase their shot totals, the duo’s ability to shoot better than expected will be depended on going into 2015. What’s changed going into the 2015 season? The biggest change for the red and black this offseason was actually confirmation of a new soccer specific stadium to be built for the 2017 season. That stadium has the opportunity to enhance the soccer experience in the D.C. area and build a bigger base of fans for the team. From a roster perspective there were just a few changes. United added Jairo Arrieta from Columbus Crew as forward depth. He will be a key contributor, especially in the early going. The most intriguing acquisition was nearly 31 year old Malmo FF and Finnish national midfielder Markus Halsti. Halsti is a versatile defensive minded midfielder who also adds depth for the defense. He should fit in well with Perry Kitchen, Davey Arnaud, Nick DeLeon and Chris Pontius. D.C. United also signed their first round pick Miguel Aguilar, who figures to get his feet wet on the wings this season. No change is good news for the defense that led the league is goals against. Second year emerging star Steve Birnbaum and Bobby Boswell anchor the center of the defense while Sean Franklin, Taylor Kemp, and Chris Korb will rotate at the fullback. When expected goals models fail how can you expect what to expect? 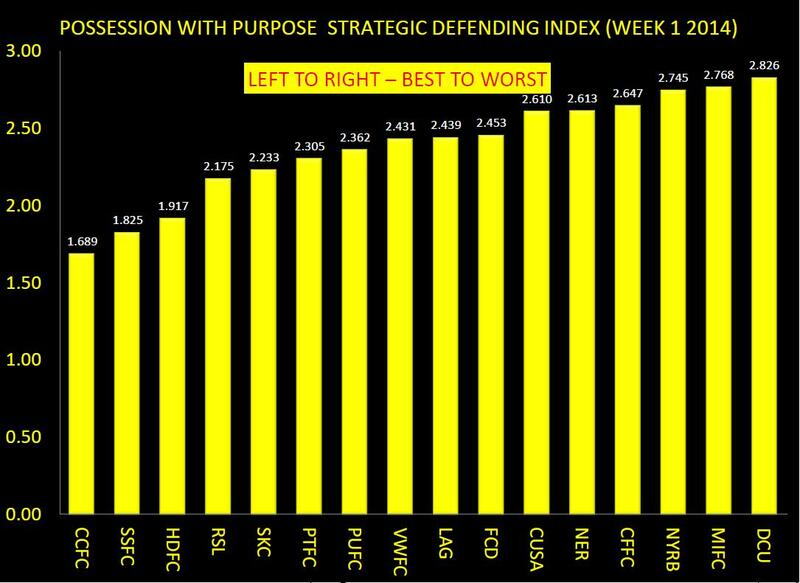 The defense-first United stand to keep up their stingy ways despite the models. The return of the core defense and the continued development of one of the bright young keepers in MLS, Bill Hamid, should mean Ben Olsen’s squad maintains their perch near the top of MLS. The offense could prove to be more difficult to maintain, at least to start the season. Espindola starts the campaign with a six game suspension and Silva has been nursing a hamstring all preseason. Eddie Johnson’s playing future is uncertain at this point due to an enlarged heart, and that leaves Chris Rolfe and Arrieta to maintain status quo. It could be a rocky opening to the season, but one of United’s strengths is that they have a number of players that can play multiple positions. Rolfe and Pontius, for example, are hybrid offensive players that give Olsen flexibility with both lineups and styles of play. And therein lies United’s core strength; while they prefer to play defense first and are usually more reactive than their competition, they can win playing all styles. Early on Ben Olsen will need to mix and match players until he lands on a core group and formation. There’s no reason to think that D.C. United will slip so far as to miss the playoffs, unless of course you believe that numbers never lie. Few teams had more turnover in the offseason than DC United. With a slew of injuries last season, the worst record in MLS , and a deal for a new stadium on the verge of breaking down, things can only get better for United in 2014. Fresh off of an appearance in the 2012 Eastern Conference Finals, and with another year of experience for young players like Perry Kitchen and Nick DeLeon, 2013 was supposed to be a return to contention for the club with more trophies than any other MLS team. Instead, they finished a full 10 (!) points behind Chivas USA for last in MLS. While their third US Open Cup trophy helped alleviate some of the pain (a consolation many supporters from other clubs would covet), the team has brought in some bigger names – including an entirely new defensive line – which they hope will turn things around in 2014. It was an offseason of additions and addition by subtractions for United, which will need to see significant improvement if Coach and United legend Ben Olsen is to keep his job. United’s multiple offseason moves culminated with winning the sweepstakes for US national team striker Eddie Johnson, a player everyone expects to outpace DC’s 2013 leading goal scorer “Own Goal” (seriously, though). Despite a -37 goal differential last year, our shot location data suggests that they were a bit unlucky to finish so low. 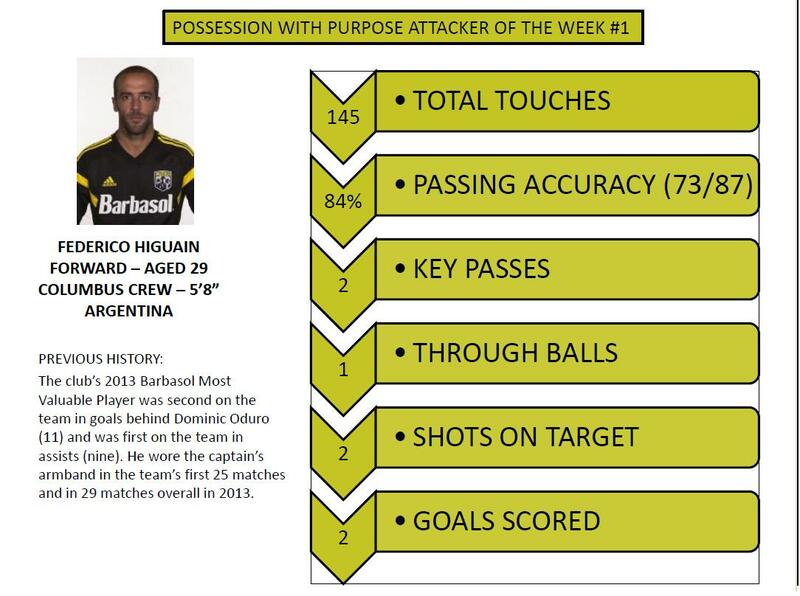 Having EJ paired with MLS veteran Fabian Espindola, DC’s strikers should score many more goals than the three Linonard Pajoy and an over-the-hill Carlos Ruiz combined for last year. The loss of Dwayne De Rosario will be felt in the midfield, but even the 2011 MVP lost his starting spot late last season. Stepping in will be former Impact captain Davy Arnaud, who will bring leadership to an otherwise young midfield. United will really hope for a healthy season from likes of Nick DeLeon and Chris Pontius who were both hampered by injuries last year, and will look to continue the progress of Canadian international Kyle Porter. Perry Kitchen returns as the backbone of a young midfield that remains mostly unchanged from 2013, but is poised to be more productive in 2014. While Klinsmann favorite Bill Hamid remains in goal, United is likely to see a 100% turnover in their defensive backline from a year ago, having brought in proven MLS defenders Sean Franklin, Bobby Boswell, and Jeff Parke, as well as Christian Fernandez, a 28 year old who comes from Almeria in Spain. By drafting Steve Birnbaum #2 overall in the SuperDraft, they also added depth and potential for the future. Franklin will provide them an attacking option up the right flank that they haven't had since Andy Najar left the team to join Anderlecht in Belgium. 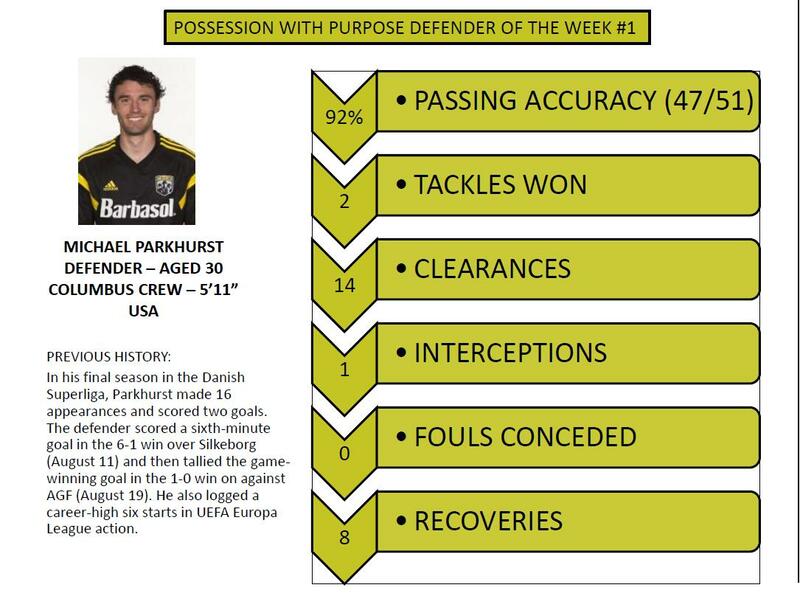 Boswell and Parke will combine to bring 19 years of MLS experience to the central defense, which should give Hamid a stronger confidence in the leadership and organization in front of him. Fernandez has spent time in La Liga and Spain's Segunda Division, and looks to bring bring a similar attacking style to the left back position, having scored 6 goals in 36 appearances for Almeria over the last two seasons. Finally, Birnbaum looks to be one of their players of the future, and will fill in for Boswell and Parke in the center of defense during a packed schedule that will include the CONCACAF Champions League in 2014. DC has taken the anti-Toronto FC route, investing across the roster rather than adding big-name DPs at a few positions. While none of their backline is cheap – United picked up Franklin in the re-entry draft because the Galaxy deemed his salary too high, and Parke isn't a bargain either – United was able to take three of their five highest paid players off the books with the subtractions of DeRo, Jakovic, and Pajoy (who was making an inexplicable $205k per year). They have invested heavily in more experienced, and simply better defenders. With no Designated Players currently on the roster, United have managed to endure more roster turnover than nearly every other team in MLS this offseason without breaking the bank. All these significant changes make this a year of questions for United; after dominating MLS 1.0 for years, they played a middling role in more recent seasons, a short slump that seemed on the verge of ending in 2012. 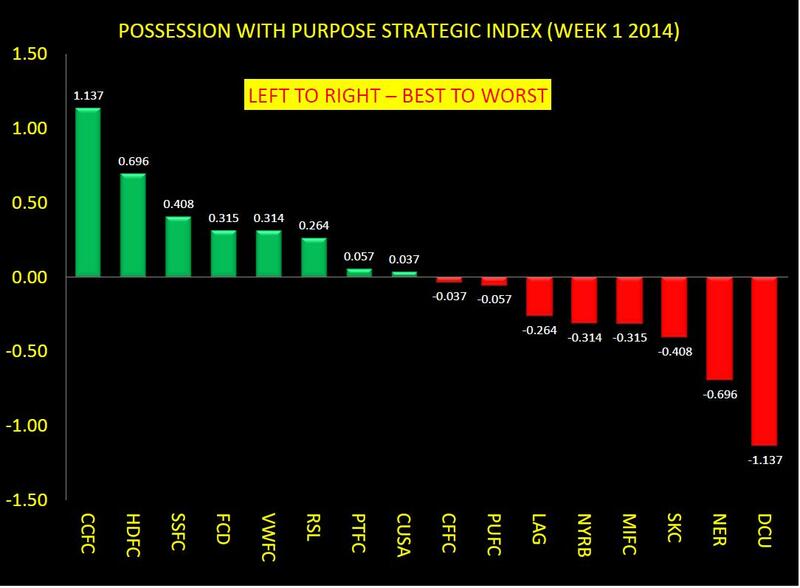 Was 2013 a regression to the mean, or an outlier as the club turns itself around? Will this be the year Perry Kitchen finally turns into an MLS star, or will he remain atop the list of players on the verge of a breakout season? With a stadium deal being called into question, can they find a new home? Will Ben Olsen save his job, or make the ownership group look stupid for keeping him this long? Can the team begin to turn around record-low attendance numbers, or can they give their supporters something to cheer about? At ASA we like to look prior data to help us understand what may happen for teams in the future, but the case of DC is a difficult one for us; no team is likely to look or play more differently than United next season. Because of their unpredictability, and because they have nowhere to go but up, the potential for DC’s season might be greater than any other team in the league this year. Will we see them do what the Timbers did last season, improving by over 20 points between seasons and going from conference doormat to MLS Cup contender? Or will they go the route of Chivas USA, and remain at the bottom of the table as the epitome of incompetence. DC United hopes this will be a transformative season that returns them to the elite of the Eastern Conference. Crucial additions to the attacking and defensive corps have the potential to turn things around, and coach Ben Olsen’s job is riding on it. Supporters are cautiously optimistic, but the public (as evidenced by our ASA poll numbers) remains skeptical. The 2014 season is an important one for United, both on and off the field. We will soon see if one of the most storied clubs in MLS history can turn their form on the pitch around, and if their important stadium plans can get back on track. Crowd Sourcing Placement: 8th place in Eastern Conference; 263 of 404 (65.1%) voters felt that D.C. United would not make the playoffs in 2014. Matthias to Drew by text after CR's third goal: [The defender definitely got beat, but the Costa Rican player didn't even get to the ball until it was 23 yards out. That's Howard's ball. Drew on Podcast: "...and Matthias was texting me...Matthias was like 'what's he doing in there? These goals are all his fault.' "
In a private interview with the Matthias, the editor was assured that Matthias never thought the goals were 100% Howard's fault, as Matthias---a student of probability---rarely believes anything is 100%. Matthias edited is the editor of the site, just in case you didn't realize that.